Verizon is now selling Apple’s iPad with MiFi 2200 in over 2,000 stores nationwide. The stores are offering 3 different bundles for customers, all including an iPad Wi-Fi with Verizon MiFi 2200. The least expensive bundle is a 16 GB iPad Wi-Fi with MiFi for $629.99. 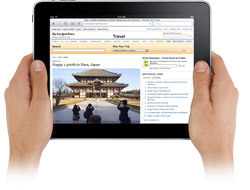 A 32 GB iPad Wi-Fi with MiFi is offered for $729.9. And, for the largest hard drive and most expensive of the bundles a 64 GB iPad Wi-Fi is offered for $829.99. The Verizon MiFi 2200 Intelligent Mobile Hotspot is a pocket-sized device allowing users to create a personal Wi-Fi cloud capable of sharing Verizon’s Wireless 3G Mobile Broadband network with up to five Wi-Fi-enabled devices.